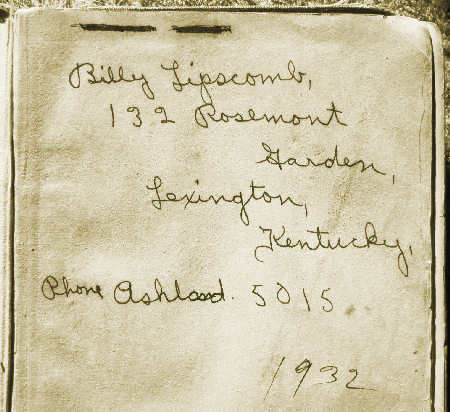 by and collected by James Lipscomb, about the early years of Bill's life. When Bill talks about his early years, he usually tells two stories and with special pride. One is from a game of a softball variant of baseball (Softball pitched overhand from 57.5 feet with 75 feet between bases and hardball rules) that Bill played while in graduate school in Linus Pauling's group at the California Institute of Technology. The game was called intermediate baseball and was played for a short time during World War II before disappearing. When Bill Lipscomb was young, he set up a chemistry lab at home. Bill made gunpowder for homemade fireworks from chemicals he purchased at a local pharmacy. First, he mixed the ingredients. Then, he began to grind. He stepped back. He does not know why. Up rose a fireball. Bill formed a musical troop with his sisters. He played the clarinet while they danced. Then, tragedy. Bill’s sister Helen in 1937 at age 17 caught polio. To finish the last two years of high school from her bed Bill taught her mathematics, and a teacher visited to teach other courses. Helen lost her dreams of an ordinary life, a husband and children, and Bill's father lost not just his job, he lost his career. No one would bring their child to the Doctor from the house of polio. He re-trained to become a psychiatrist. In the meantime Bill had to go to an inexpensive college, the University of Kentucky on a music scholarship as a marching clarinet player [KentuckyAlumnus1976-1977] with help from his summer job distributing seeds to farmers. He donated his home chemistry lab to his high school, more than doubling their equipment. When his college chemistry professors saw how much Bill could handle, they bumped up the quality of some of the courses to the dismay of the other students. They asked Bill to tell the professors that he could not follow at this greater pace. Bill's answer is unknown, but he tends towards the truth. Bill's father, however, could tell a tall tale. On his 50th wedding anniversary he and his wife dressed up and took their daughter, Helen, to a nice restaurant. The waitress asked, “What’s the occasion?” Bill’s father indicated his middle-aged, wheelchair-bound daughter and deadpanned, “For her peace of mind we finally decided to get married.” I am told that the waitress did not speak to Bill’s father for the rest of the evening. BIll's dry sense of humor may have some origins here. Bill Lipscomb was distinguished long before he was awarded the Nobel Prize in Chemistry in 1976. By way of coping we children dubbed him Sir Father. Bill took particular delight that when his guests remarked on how polite his children were, calling their father, Sir, that they did not also notice that we were smirking. Indeed, in 1973 Bill really was made an honorary Kentucky Colonel, of all his awards the only one that hangs in his bedroom. He gleefully explained that the award was in a sense meaningless in that it was nothing more than an honor. 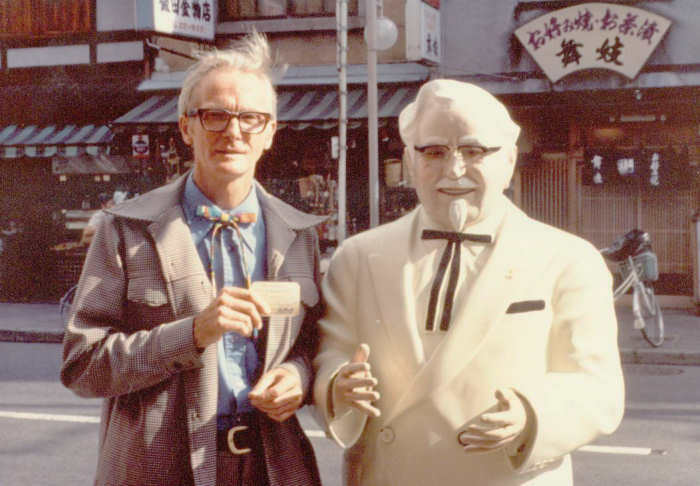 Bill in Japan holding his Kentucky Colonel card by a statue of Colonel Sanders. Photo © 1979 Jean C. Evans under a Creative Commons Attribution 3.0 Unported License. There were two rules in the early Lipscomb household. As your knife traveled from the butter dish to your dinner roll, the butter on the knife was fair game to a swooping attack, diverting the butter to ones own roll. This was a surprise to the occasional dinner guest. That is when Bill did the honors. The rest of us were too polite. Bill pushed a bowl towards the dinner guest. The guest picked the one on top, and cracked it open as she continued talking. When she saw just the cracked shell and nothing more in her hand, she stared in disbelief and disappointment. The day before, Bill had gently cracked that walnut into two unbroken halves, scooped out the inside, and glued the shell back together. For the son of Bill Lipscomb the early years included advanced science books given to a young boy. In grade school along with Dr. Seuss’s books Bill stocked my bookshelf with The Restless Universe by Max Born, One, Two, Three, Infinity by George Gamow, and the Mr. Tompkins physics books. He also gave me a college textbook, Astronomy an Introduction by Robert Baker, and I studied it. I began to be interested in physics and particularly, in one of these books, in the Minkowski diagram, which really puzzled me. The axes of space and time rotate to calculate the distortions of space-time near the speed of light, but it wasn’t quite clear if these axes really rotated in the natural world, or if they rotated only mathematically to explain the phenomenon, and I puzzled over that a while. One of Bill's World War II military research projects during graduate school had him sometimes carrying vials of pure nitroglycerin. Bill told me that it was safest to hold the vials by the bare fingertips, so that the heat of one's hand might not detonate the solution, knuckles out to absorb shock, and that not wearing gloves reduced the chance of dropping a vial. Later, Bill taught me four precise steps for how to handle dry ice with my bare hands. When I was in early grade school, Bill showed me that centrifugal force would reduce the chance that we would slip and fall when we left the fenced trail to run behind and half-way up the Minnehaha Falls in Minneapolis Minnesota on a semi-circular, wet, narrow, ledge that sloped down to the rocks perhaps 20 feet below. I suppose that all fathers give their sons safety tips. Bill bought a Sears and Roebuck air rifle [Lipscomb1977] when I was in high school so that I could dispose of vials his labs old experimental solutions, glass ampoules of boranes that exploded on contact with air. There was no company or agency that would take care of it. 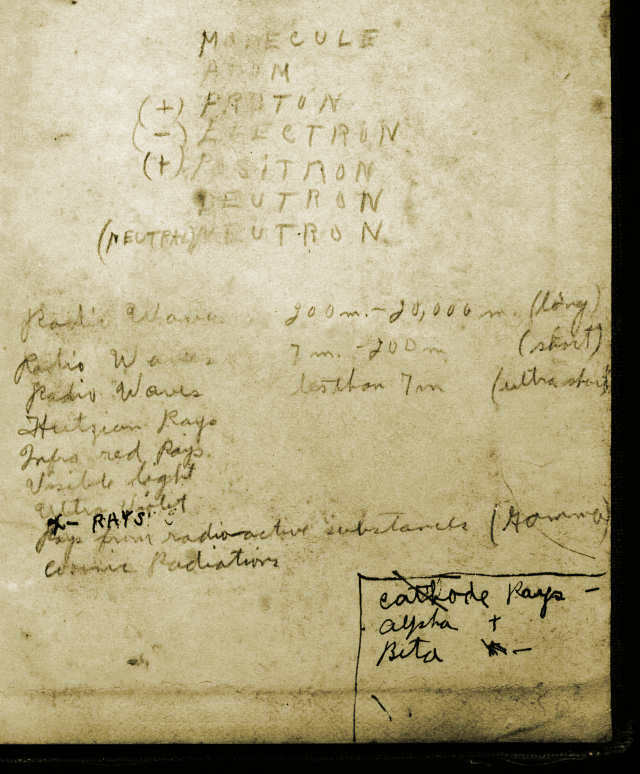 Bill paid for the air rifle himself, as he did with the many sets of poker (or maybe bingo or roulette) chips he bought to tape to the hanging clear plastic sheets of the carboxypeptidase A electron density map to indicate atomic positions. He did not want to have to explain billing the granting agency. The beginning and the end of the air rifle era are told by Donald Voet in the great air rifle caper. My fireball arrived in the air rifle era when a graduate student heated a tube on a glass vacuum line and pulled off a sealed ampoule. It held 1 cubic centimeter of liquid diborane, which explodes with a sharp crack (and violently; 1 cc is a lot), mixed with 5 cc of pentaborane, which flames for a second or two. The ampoule was too dangerous to carry up to our roof-top shooting range, because the compounds within explode on contact with air, so the tiniest crack in the glass could set them off. Gently the student put the ampoule in a metal dewar (heavy-duty thermos bottle) and placed it, now a flamethrower pointing up, on the Gibbs Lab fire escape at the right-hand pane of the big window centered in the photo. On the grating a floor above (upper left of photo) someone laid down a sheet of safety glass. I knelt down on it and shot the air rifle just over the edge diagonally down (down and to the right in the picture), into the upward-pointing mouth of the dewar. I was too close to the explosion to see it. Behind my safety glasses I flinched from intense heat as the dewar blasted a fireball up past the window partly visible at top center. Then the crowd. I opened my eyes to see, across the parking lot, visitors queued for a back door of the Peabody Museum all looking towards Gibbs. Graduate students in the room (not visible beyond the upper right) above the rightmost half-visible window came out surprised and slightly concerned, as the expanding radius of the fireball was sufficient for it to pass their window. Having a chemist for a dad can be very cool. Whenever Bill's father served as a physician at Boy Scout summer camp he brought young Bill with him. Bill became a Star Scout (two ranks below Eagle Scout) and an enthusiastic outdoorsman. Later he would drive his young family 200 miles north of St. Paul, Minnesota, for a few weeks in two summers in a log cabin on the shore of Deer Lake, close to Little Deer Lake, living on the fish we would catch. Back in his youth, while camping in the open in his sleeping bag, a meteor shower started in which the meteors were so bright and frequent, every few seconds, that they woke him up. When Bill talks about his early years, he usually tells two stories and with special pride. The other one is of an advanced science book given to him by Prof. Harold H. Downing, professor of mathematics and astronomy at the University of Kentucky. As we open the front cover we see that Bill's mother, Edna, has written Bill's name, address, and phone number. Bill wrote the date, 1932. He was about 12 years old, the year that his mother gave him a chemistry set, which grew into a home chemistry lab. As we flip the pages, we see that they are wrinkled from a night in the rain in the little tree house that Bill built. As we flip the pages time passes, tastes change. Bill highlighted the problem in pencil on page 432. Reaching the inside back cover we see that Bill had started a list that grew with time. Penciled in a young hand is MOLECULE. Below that, ATOM. Following, is PROTON and next to it a plus sign. After that, ELECTRON, which evidently is negative. Then, POSITRON, DEUTRON, NEUTRON. Then, in an older hand the wavelengths of light. Then, in ink, Cathode Rays, Alpha [particles], and Beta [particles]. I thank my wife Margaret Lipscomb for her interview of Bill Lipscomb in 1998 from which the longer quotes in the article are drawn. I also thank her and my son Thomas Lipscomb for proofreading and suggestions; some of the remarks here are theirs. [Katz2000] Katz, Lewis. Letter presented to Bill on the occasion of his 80th birthday, collected with others in a Festschrift (party book), May 12-14, 2000. [Lipscomb1977] Lipscomb WN. The Boranes and Their Relatives. Science: 196(4294):1047-1055 (3 June 1977). See "air gun" on page 227 of the nobelprize.org pdf. [Baker1930] Baker, R.H. (1930) Astronomy an Introduction, D. Van Norstrand Company, Inc.
William Lipscomb at age 11: From his collection, reprinted on this website with permission from William Lipscomb. 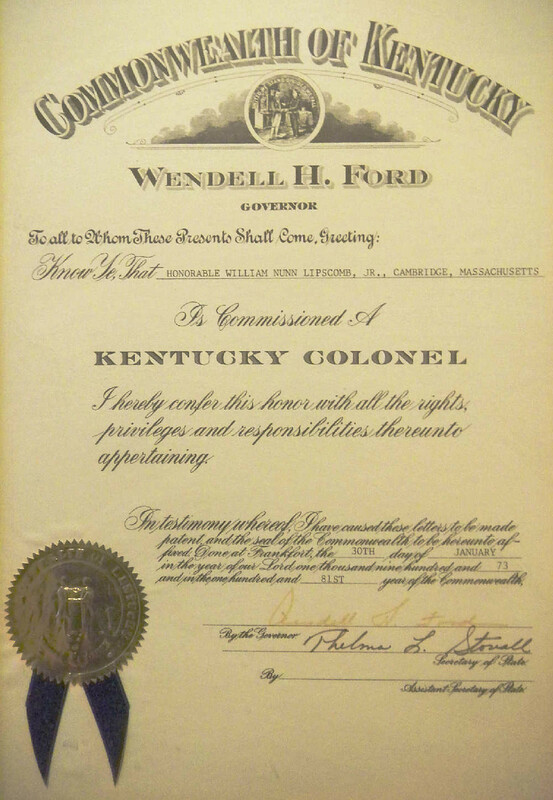 Kentucky Colonel certificate: Scanned by James Lipscomb. Kentucky Colonel statue: By Bill's wife Jean C. Evans, see copyright below. Reprinted here with her permission. 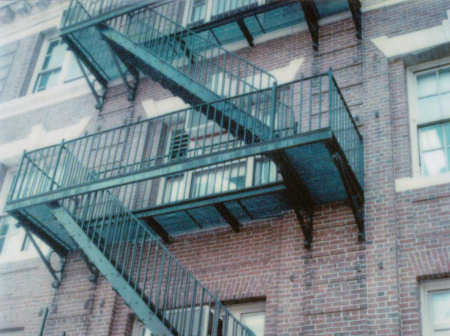 Air Rifle and Gibbs Fire Escape: Photos by James Lipscomb. Astronomy book "The stars are too hot to burn." scan excerpted under the copyright doctrine of Fair Use, which allows duplication of copyrighted work if the use is non-commercial, scholarly, a small fraction of the full work, and does not affect the market value of the work. Astronomy book handwritten page scans by James Lipscomb from the book given ot him by Willam Lipscomb. An early version of this web page is published under the terms of the Creative Commons copyright below in the book, The Selected Papers of William N Lipscomb Jr.: A Legacy in Structure-Function Relationships. Exception: Photo of William Lipscomb with the statue of Colonel Sanders is copyright by Jean C. Evans and freely available under the Creative Commons License immediately above with attribution to Jean C. Evans.